Year: Make / Model: 96-06 CADILLAC ELDORADO DEVILLE DTS SEVILLE. ONE CAP ONLY. SEVILLE ELDORADO FLEETWOOD DEVILLE DuringYears year s 1989, 1990, 1991. 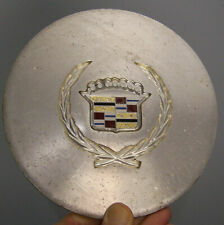 Cadillac Center Cap In Driver Condition With Nicks & Scratches. Part # 1641008. Year: Make / Model: 96-06 CADILLAC ELDORADO DEVILLE DTS SEVILLE. Fits: Will fit many different years and wheels on many Cadillac cars from 1992-2008 including the Deville, Seville, Eldorado, and DTS. They made many different wheels on the these Cadillac's. Condition: New. It fits Eldorado 1995-2002, Seville 1995-2001, Catera 1997-1998, and Deville &DTS 2000-2008. There are many wheel and center cap options for each year & model of Cadillac. Finish: painted silver. These do not have Cadillac crest in center. See pictures for details to be sure it is the style you need. There are many wheel and center cap options for each year & model of Cadillac. These do not have Cadillac crest in center. There are multiple wheel options for each year, make and model. These do not have Cadillac crest in center. There are many wheel options for each year of Cadillac. The price is for each (1) center cap. There are multiple wheel options for each year, make and model. I HAVE THE SETS IN WHITE & GOLD.THEY ARE PEEL AND STICK CENTERS. As you can see they are in decent condition with typical wear & tear / scratches etc. I am also providing a file image photo showing the clip design on the back. 4521B-CC SET. (1) Set of 4. Our policies are as follows. 1995-2002 Cadillac Eldorado 7 Spoke Silver Wheel / 1995-1996 Eldorado 8 Spoke Wheel / 1995 Cadillac Seville 8 Spoke Wheel. 1995-2002 Cadillac Eldorado 7 Spoke Silver Wheel. 1995-1996 Cadillac Eldorado 8 Spoke Silver Wheel. Part number on cap: 3539324. ELDORADO 92 16x7 (aluminum), 14 slot. ELDORADO 93-94 16x7 (aluminum), 14 slot, brushed finish. SEVILLE 92 16x7 (aluminum), 14 slot. SEVILLE 93-94 16x7 (aluminum), 14 slot, brushed finish. This is a used (Recycled!). hubcap set from a salvage yard. Everybody makes mistakes. But we won't argue with you. You won't need to wear gloves to install your hubcap and your hands will not get dirty! 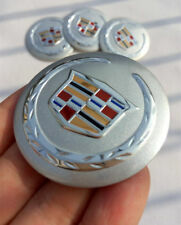 You are purchasing a Used Cadillac Eldorado 1995-2002, Seville 1995-1997 STS Center Cap Silver # 3544650. Each one has varying degrees of wear and tear / nicks / scratches etc. All legs are good on the back however (3) legs were repaired with epoxy (see photo's). It still fits good. Suburban Wheel Cover has been serving the automotive industry since 1980. 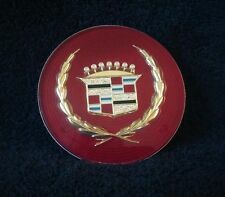 1988 Cadillac Eldorado Wire Wheel Hub Cap Center Emblem. 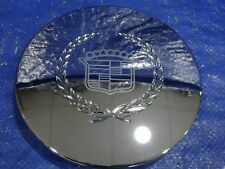 1988 Cadillac Front Wheel Drive Seville Wire Hub Cap Center Emblem. 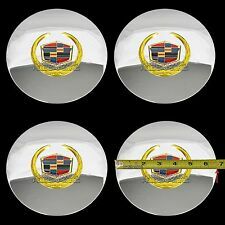 Application: 1986 - 1988 Cadillac Front Wheel Drive Deville Wire Hub Cap Center Emblem. It has normal wear and tear on the face. All legs are good on the back. (1) Single Center Cap. Suburban Wheel Cover has been serving the automotive industry since 1980. This is our job and we care about what we do. There are many wheel and center cap options for each year & model of Cadillac. These do not have Cadillac crest in center. The price is for one(1) center cap. There are multiple wheel options for each year, make and model. 1992-1994 Cadillac Eldorado / Seville with 14 Slot 16" Aluminum Wheel (See Example Photo). 1992-1994 Cadillac Eldorado. 1992-1994 Cadillac Seville. All legs are good on the back. Suburban Wheel Cover has been serving the automotive industry since 1980. Late 1980's - Mid 2000's Cadillac Deville Seville Eldorado CTS. Late 1980s to mid 2000s Cadillac's Eldorado, Seville, DevilleFront Wheel Drive cars -- Options may vary, Must match pictures. Fits many other Cadillac's from the 1990's to the 2000's. FACTORY OEM WHEELS. give us a call at 626-388-3910. If we don't have it, we can usually get it! HOG ON WHEELS. 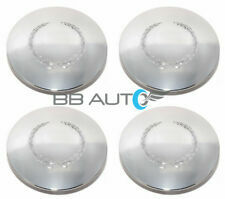 1995-99 Cadillac DeVille SeVille Wheel Center Cap 9593128 SET OF 4 matte finished. 1992-1997 Cadillac Seville STS, SLS. 1992-1997 Cadillac Seville (and many other 1990's Front Wheel Drive Cadillac's). Cadillac Seville. P lease check our pictures. Rims are not bent or cracked. They do need to be polished and cleaned. 1989-1993 Cadillac 60 Special, Deville, Eldorado, Fleetwood, & Seville Front Wheel Drive. 1989-1991 Cadillac Eldorado. 1989-1991 Cadillac Seville. 1989-1993 Cadillac Deville. These wheels may fit other makes and models. 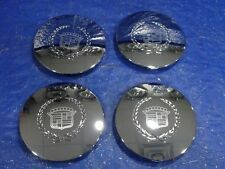 Cadillac 1989-1991 Seville Eldorado OEM Center Cap Machined Alloy pn#25535311. Condition is Used. 89-91 Eldorado, 89-91 seville About 6.5" inches in diameter Has scratches and scuffs ( see photos) This is a metal cap, not plastic, with metal clips. I ship items the day i receive payment, or the following business day. Late 1980s to early 2000s Cadillac's Eldorado, Seville, Deville Front Wheel Drive cars -- Options may vary, match pictures. 2003-2005 CADILLAC DEVILLE DHS, FITS MANY OTHER CADILLACs. Fits many other Cadillac's from the 1990's to the 2000's. THIS IS A FACTORY ORIGINAL CENTER CAP. Late 1980's - 2005 Cadillac Deville Seville Eldorado. Late 1980s to early 2000s Cadillac's Eldorado, Seville, DevilleFront Wheel Drive cars -- Options may vary, Must match pictures. Fits many other Cadillac's from the 1990's to the 2000's. Trending at $18.76eBay determines this price through a machine learned model of the product's sale prices within the last 90 days. 1993-1996 Cadillac Eldorado. 1993-1995 Cadillac Seville. It has typical wear and tear / car wash scratches etc. All legs are good on the back. (1) Single Center Cap. Suburban Wheel Cover has been serving the automotive industry since 1980. 1989-1991 Cadillac Seville. Fits: 1989-1995 Cadillac Deville. 1989-1993 Cadillac Fleetwood. 1989-1991 Cadillac Eldorado. 1994-1996 Cadillac Concours. This item looks nice on a daily driver; has a nice mirror shine. This has a part number of 3544650. This will attach on good or your money back. This item is used. This Item is being Sold AS- IS! Cadillac Seville Eldorado Deville FWD wheel Hub Cap Center red emblemwith silver wreath 1986 -1988. good condition with scratches. Center caps for the wheels of your Cadillac Seville are available in a wide variety of colors, shapes, and styles. While center caps play a functional role in the performance of your Cadillac, they are also a unique way to enhance the visual appeal of the vehicle. It's a good idea to learn about the different Cadillac center cap options that you have to choose from, what they do, and how to care for them. Why should you replace Cadillac wheel center caps? The caps that adorn the center of your Cadillac's wheels are useful for two important reasons. It's important to obtain replacement center caps to continue protecting your Cadillac's wheels and prevent premature wear of other parts. 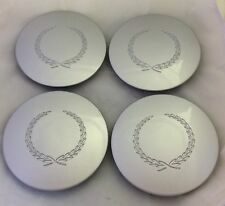 Most of these caps are constructed from durable materials and plated with chrome. Other finishes that better match your Seville or your personal tastes are also available. Because center caps are attached to the outer center of your car's wheels, dirt and debris from the road can cause wear and tear over time. Chrome center caps improve the appearance of your vehicle by hiding unsightly lug nut assemblies. They act as a cover for these parts and provide your vehicle with a classier, more uniform look. In addition to hiding other parts of your Cadillac's wheelbase, the caps at the center of the wheels protect the car's axle as well. Both the axle and wheel hubs of your car will last longer and work better if they are protected by functioning center caps. Center caps will also help to ensure any loose nuts are not damaged or lost should they happen to fall out of place. What center caps are available? Although every wheel covering performs the same basic function, there are several styles available to you. If you're looking for replacement parts because your current ones have worn out, you may wish to replace them with new chrome center caps featuring unique designs that match your vehicle, appeal to your personal style, or both. You can select chrome center caps featuring the iconic Cadillac logo. These items are compatible with most Cadillac models, including the Seville. If you prefer something besides basic chrome, many options are painted in various colors and still feature attractive Cadillac design elements. 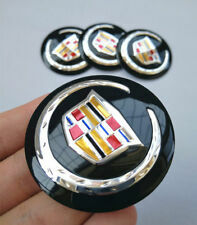 Two-tone chrome-and-black caps or those with raised emblems provide a stylistic touch to your Cadillac's wheels. How do you install Cadillac center caps? If you're ready to replace your old covers with new ones, you can use these basic guidelines to perform a successful installation. A metal retention ring will fit inside the new center caps. Once the ring is firmly in place, position the center cap over the opening where the old unit was housed. Press the center cap into place using firm, even pressure until it stops. Do the same for the remaining wheels until you have a matching set of new center caps installed on your Cadillac.